1437 | What Does 1437 Mean? 1437 means "I Love You Forever" (the number of letters in each word). 1437 is formed by using the number of letters in each word (I (1) Love (4) You (3) Forever (7)). 1437 is commonly used in internet chat forums and text speak to express permanency when making a declaration of love. However, it can also be used casually as a throwaway line to add weight to a request for a favor. 1437 can be a declaration of undying love. Person A: While you're at the shop, get me a pack of cola. 1437. Person B: Yeah. I bet you do. Person A: I cannot believe that you've agreed to marry me. 1437! 1437 is typically used as a standalone declarative sentence (i.e., a statement). In other words, it is not used as a part of speech within a wider sentence. 1437 is defined as a cyber term because some of its characters are used as substitutes for letters. Most cyber terms were introduced to reduce the number of key strokes required to write words or phrases, but since the arrival of predictive texting and keyboards on mobile devices this efficiency is no longer required. Nevertheless, cyber terms are still regularly used to make messages more entertaining or to express individuality. 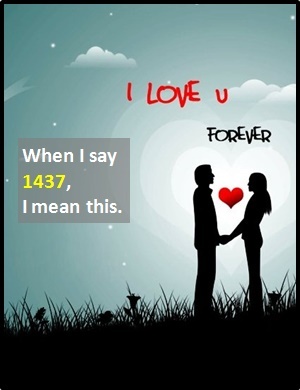 Before the digital era, we would have just said something like "I Love You Forever" instead of using 1437.